Spring is a magical time of year in the Netherlands. Little buds pop up left and right, blossoming and maturing into colorful flowers. The capital city, Amsterdam, is in full bloom, welcoming the warmer weather, longer-lasting daylight in the evenings and clean, fresh air. Bikers shed their winter coats and thick scarves, trading the apparel for light jackets and chic sunglasses. Terraces are packed with residents and tourists alike soaking up the sun and sipping on a refreshing drink. The nearby countryside, known as the bulb growing region, boasts sprawling tulip fields, spanning every spectrum of the rainbow. Only open eight weeks annually, typically from the end of March to mid-May, the internationally-renowned Keukenhof is an absolute must-visit attraction. 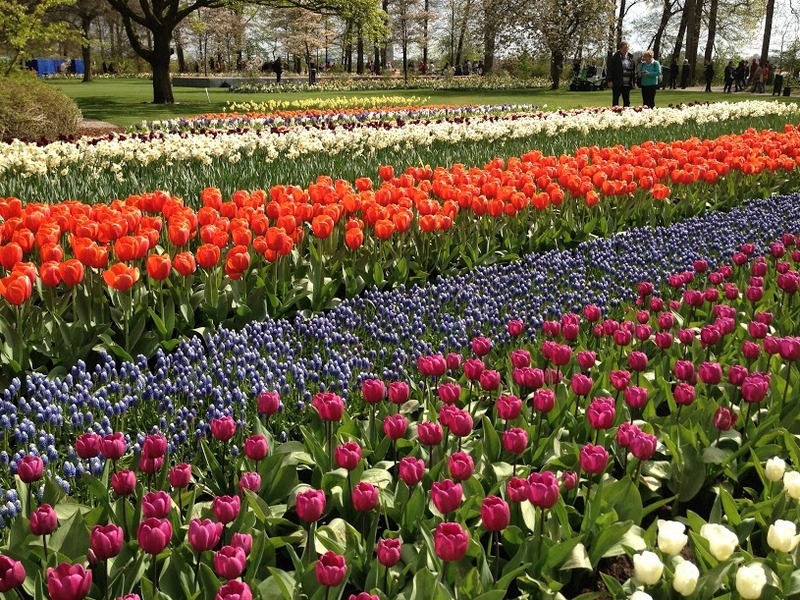 A colorful spectacle, the majestic gardens in Lisse feature an overwhelming seven million flowering bulbs, including 800 varieties of tulips. Every year, the garden embraces a different theme, explored through the art and designs around the property. The winding foot paths reveal spectacular flowers around every turn. From orange creamsicle hues and blues so vibrant it’s mesmerizing, to sunshine yellows, bright lipstick cherry reds and blushing baby pinks, the colors are never-ending. As far as the eye can see, visitors are surrounded by lively flowers in grandiose designs. The park is accessible by both car and public transport. 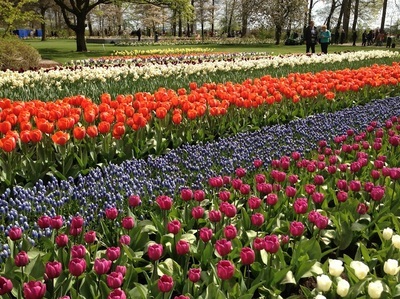 Outside the Keukenhof, a variety of activities await. There is a possibility to view the area from above, flying over the bright fields in a plane. Alternatively, tourists can bring their own bike or rent, discovering the surrounding area while cycling. Prefer to see the colors from the water? Set sail on one of the 45-minute boat trips. Flora Holland, located in nearby Aalsmeer and also accessible by car or bus, is the world’s largest trading center for plants, flowers included. Set your alarm to rise with the sun, as the center opens to visitors at 7 a.m. The earlier you arrive, the more you’ll see, as the beginning of the day is the busiest. Watch as the little vehicles speed by, strategically transporting carts of flowers all while avoiding collisions. The entire center acts as a hub, preparing plants for the auction, as well as to ship around the world. Additionally, peek in as designated buyers bid on desired products. 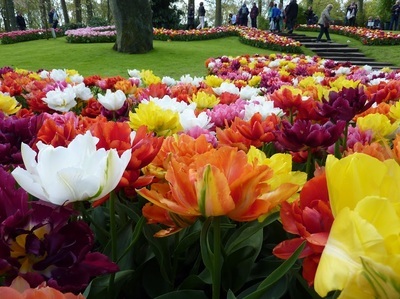 Upon returning to Amsterdam, continue the flower-themed tour at the Bloemenmarkt, situated on the Singel. It is the only floating flower market in the world. The stalls are packed with flower bulbs and other related souvenirs. Take in the fresh aromas and have a look for yourself. Double check that there is a customs-cleared stamp on the package before you take the plants or seeds out of the country. As you walk, pop into one or two of the shops for a free sample of delicious Dutch cheese, like Gouda. Making your way over to the east part of the city, the Hortus Botanicus is one of the oldest botanical gardens in the world, dating back to 1638 when it started as a medicinal herb garden run by the Amsterdam City Council. Featuring around 4,000 plant species, the indoor greenhouses and outdoor manicured garden offer a fun location to both walk and learn. You’ll find plants such as palms, cycads, carnivorous and medicinal varieties, as well as monumental and ornamental trees. Don’t miss the butterfly house, home to the beautiful, patterned creatures silently fluttering by. Quiet and peaceful, the botanical gardens offer a great half-day activity. In your spare time, especially if the sun is shining, pack a picnic and stroll through the Vondelpark. The beautiful green park is quite large and provides ample opportunities to walk, bike, run or lounge on the grass. Listen to the birds sweetly sing and watch the dogs playfully romp around with their owners. Families with young children frolic through the open spaces, while friends chat over a refreshing beverage. It’s an oasis in the middle of the busy city. Looking for more action? King’s Day, which falls on April 27, is a party you will surely not want to miss. Held every year in honor of King Willem-Alexander, the King of the Netherlands, the entire country transforms into a sea of orange, from orange hats, clothes and feather boas to banners and flags. Many cafes and restaurants hold parties and in the Vondelpark, people gather for an open-air market. One day a year, everyone is allowed to sell whatever they want, such as food, toys and other goods to the public. On foot or by boat, the party starts the day before for King’s Night and continues the entirety of King’s Day. If you’re in town, make sure to pack or buy something orange.